The Asia-Pacific remains one of the key battlegrounds for manufacturers of fighter aircraft. With diverse operational requirements and complex political considerations to take into account, the region’s frontline fighters include international and indigenous offerings. This report excludes lightweight fighters and light combat aircraft as well as carrier-based fighters and future fifth-generation projects so as to focus on the in-service multirole fighters that invariably represent the ‘sharp end’ of their respective operating air forces. Among the current fighter products from European manufacturers, the Eurofighter Typhoon is yet to win orders from customers in the Asia-Pacific. Its close rival, the Dassault Aviation Rafale family has been ordered by India, but not in the numbers originally envisaged, with New Delhi committing to 36 Rafale-F3A/B aircraft, with further batches likely to be contracted at a later stage, according to local media reports. Contract signature for the Rafale deal took place on 23rd September 2016 during a visit to New Delhi by the French minister of defence and veterans affairs Jean-Yves Le Drian. 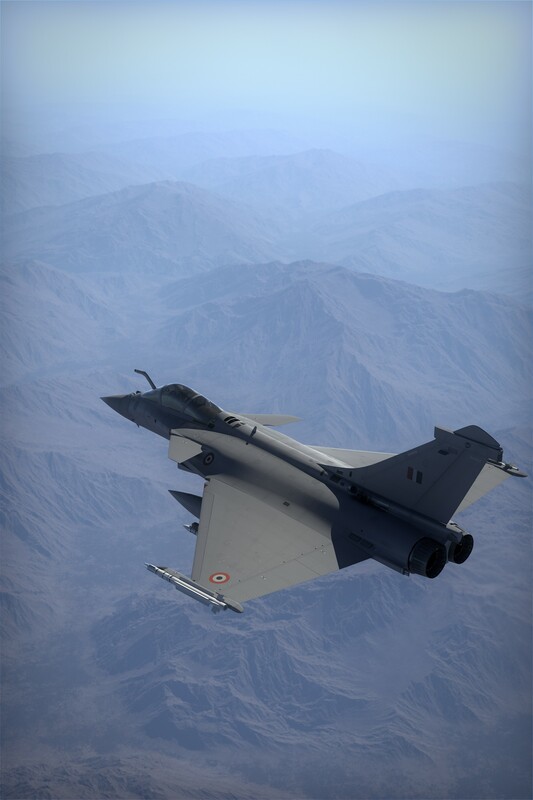 The government-to-government deal covers 36 Rafales, 28 single seat Rafale-F3A and eight two-seat Rafale-F3Bs that will be provided to the Indian Air Force in a ‘flyaway’ condition and is understood to be worth around $8.4 billion, reports continue, around half of which comprises offsets for Indian industry. The fighters will be delivered from September 2019 and the deal also includes weapons, including the MBDA Meteor Active-Radar Homing (ARH) guided Air-to-Air Missile (AAM). The Rafale family’s predecessor, the Dassault Mirage-2000 family is now out of production but won export orders in the Asia-Pacific from India and the Republic of China (ROC). A $2.4 billion contract for the upgrade of the Indian Air Force Mirage-2000H/TH fleet was signed in July 2011. 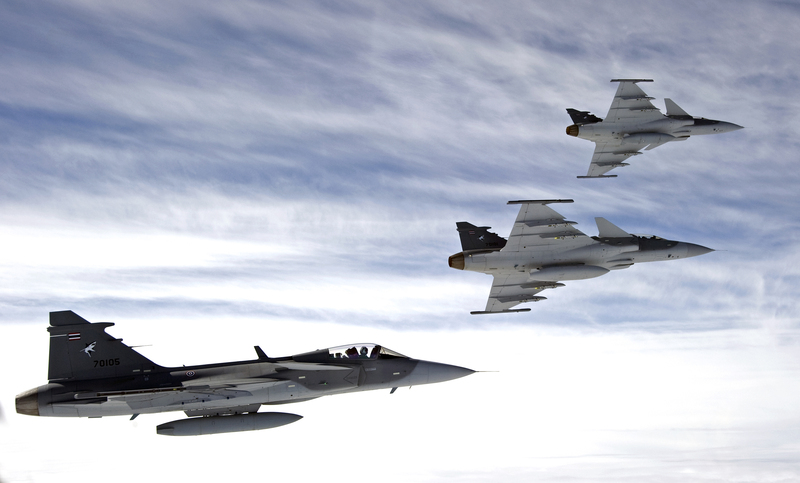 The first two upgraded fighters were accepted on 25th March 2015. India’s Hindustan Aeronautics Limited (HAL) will upgrade another 47 of the aircraft in India. The upgraded fighters have received the revised designation Mirage-2000I/TI. 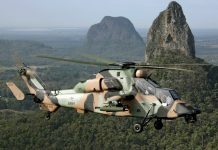 Thales provides most of the new equipment in the upgraded aircraft, including the RDY-2 X-band (8.5-10.68gigahertz/GHz) radar, a helmet-mounted display, new avionics including a mission computer, and a new electronic warfare suite. The ROC’s fleet of Mirage 2000-5EI/DI fighters, delivered from 1997, are receiving a more modest upgrade. 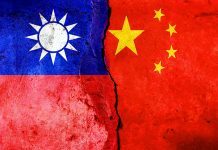 The local National Chung Shan Institute of Science and Technology is embarking on a programme to extend the shelf life of the MBDA MICA ARH/Infrared guided AAMs that arm the 56 of the surviving aircraft, from a total of 60 delivered. Reports state that the balance of four aircraft may have been mothballed due to a lack of spare parts. An unsuccessful candidate in India’s original MMRCA (Medium Multirole Combat Aircraft) competition launched in 2001, and eventually won by the Rafale-F3A/B (see above) to replace a significant portion of the IAF’s legacy Soviet/Russian supplied fighter fleer such as the MiG-21 fighter family, the Saab JAS-39C/D Gripen fighter currently serves in the Asia-Pacific with Thailand. Bangkok acquired twelve JAS-39C/Ds as part of an air defence package that also includes two Saab 340 Erieye Airborne Early Warning aircraft. The final batch of six JAS-39C/Ds was delivered to Thailand in September 2013. Since then, one aircraft has been lost in an accident. Away from Europe, the Sukhoi Su-30 fighter family is well represented in the region, with different variants produced by two separate production facilities in Russia, as well as under licence in India, and in the form of unlicensed copies in the People’s Republic of China. 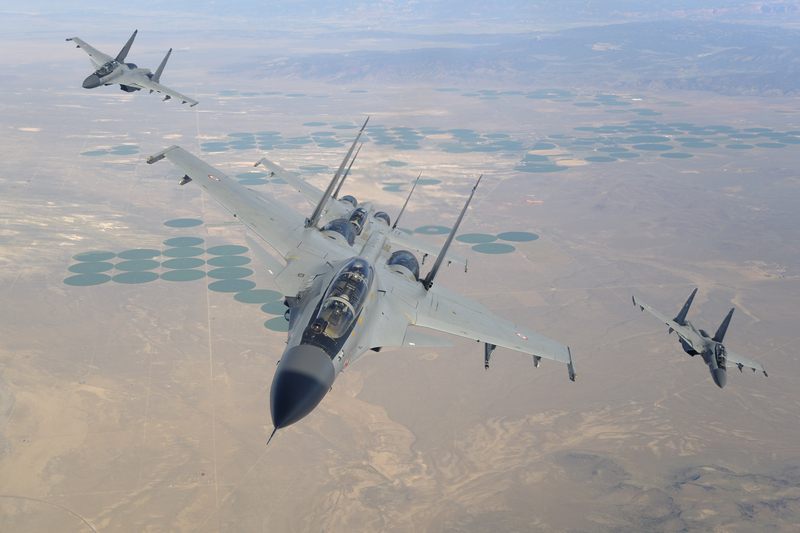 The success of the aircraft began with an order from the IAF for the Su-30MKI version manufactured by the Irkut Corporation, part of Russia’s United Aircraft Corporation (UAC). An initial contract was signed for the acquisition on 30th November 1996 and the most recent on 24th December 2012. In total, New Delhi has purchased 272 Su-30MKIs. By early 2016, the IAF had received around 225 aircraft, including 50 delivered in a ‘flyaway’ condition from Russia and 175 built locally by HAL. The Su-30MKI is being brought up to the so-called ‘Super 30’ standard with the addition of a new fire control radar, thought to be KRET’s Zhuk-A X-band active electronically-scanned array system. The Indian Su-30MKIs are also to receive new avionics and a KRET Khibiny electronic warfare system, plus BrahMos Aerospace BrahMos satellite/ARH guided air-to-surface missile and the indigenous Defence Research and Development Organisation Astra ARH-guided AAM, according to open sources. A derivative of the Indian Su-30MKI, the Su-30MKM was produced for Malaysia, which received 18 examples in between 2007 and 2009. 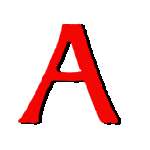 The Komsomolsk-on-Amur Aircraft Production Association (KNAAPO), also part of UAC, also produces the Su-30MK for export, with the initial foreign client being the PRC. The country purchased 76 Su-30MKK fighters between 2000 and 2003 followed by 24 improved Su-30MK2 fighters in 2004. Thereafter, Beijing switched to the local development of its own Shenyang Aircraft Corporation (SAC) J-16/D fighter, as an indigenous counterpart to the Su-30MK2. The J-16 first flew in October 2011 and reportedly entered service in May 2015. Other KnAAPO Su-30MK customers in the region include Indonesia, which acquired two Su-30MKK fighters in 2003, and nine Su-30MK2 fighters in 2008-13. Vietnam received 24 Su-30MK2V fighters between 2004 and 2012, and another batch of 12 Su-30MK2Vs were ordered by Hanoi in August 2013, deliveries of these beginning in 2014. In 1991 China became the first export customer for the KNAAPO Su-27SK. A contract for 46 aircraft was signed in 1991 and was complemented by an additional 28 aircraft delivered in between 2000 and 2002. Included in these agreements was a $1.2 billion contract for SAC to licence-build 200 Su-27SKs under the Chinese designation J-11. In the event, KNAAPO delivered only 95 kits before production shifted to the J-11B, an upgraded indigenous version. The J-11B was first to add an element of multirole capability, with an undisclosed Chinese multi-mode pulse-Doppler X-band radar and updated ‘glass’ cockpit. The PRC’s ‘legacy’ fleet of Sukhoi Su-27 family and SAC J-11A/B fighters are not strictly multirole in the modern sense, lacking a genuine precision attack capability in their basic form. However, the J-11D first flown on 29th April 2015, represents the next-generation of the aircraft. 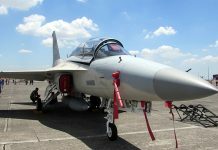 The fighter reportedly incorporates new AESA radar, a greater proportion of composite materials, radar-absorbent coating and a modernised fly-by-wire control system. Most observers assume the J-11D will be introduced in the form of a mid-life upgrade for existing J-11B fighters. As well as the ‘all-up’ J-11D, the basic J-11A is also receiving upgrades, including a infrared missile approach warning system and Vympel R-77 ARH-guided AAMs. 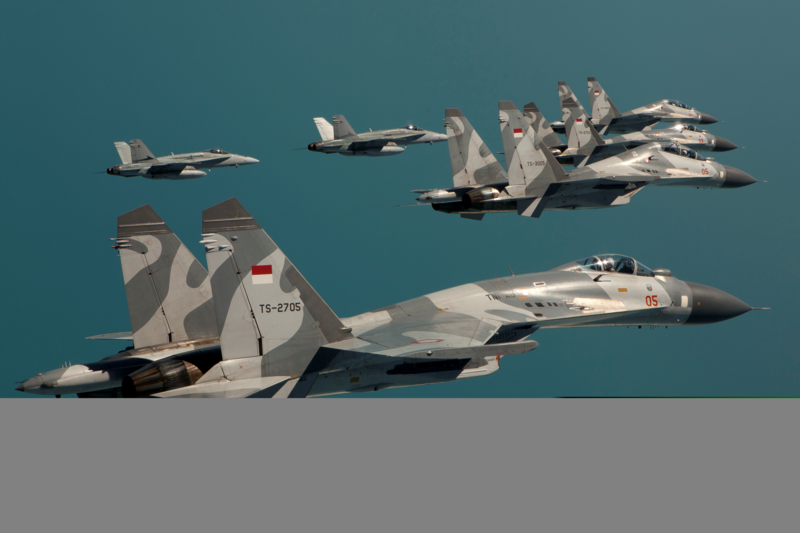 ‘Legacy’ Su-27 family aircraft are also operated by Indonesia and Vietnam. Indonesia acquired two Su-27SKs in 2003, and became the only customer for the improved Su-27SKM, three of which were delivered in September 2010. Vietnam ordered a first batch of six Su-27SK/UBK aircraft, valued at $150 million delivered in 1995, while the second batch of six, priced at $120 million, was delivered in 1998. The fortunes of Sukhoi’s fifth-generation T-50 fighter rest heavily upon India. The joint Russian-Indian Fifth-Generation Fighter Aircraft (FGFA) programme is being pursued jointly by Sukhoi and HAL on the basis of the T-50, however, its future is far from certain: Media reports have noted that India is yet to determine the quantity of fighters it plans to acquire and there is little clarity on Indian industrial participation in the project. Furthermore, the aircraft which is eventually developed as a result of the FGFA undertaking will have to compete for funding against further Su-30MKI upgrades (see above), the acquisition of a new single-engine fighter planned for licence production and HAL’s future Advanced Medium Combat Aircraft (AMCA) project: “The Indian Air Force doesn’t believe in the (FGFA) aircraft,” contends Angad Singh, a New Delhi-based aerospace analyst. Air Chief Marshal Arup Raha, the IAF’s chief of staff, who held the post until 31st December 2016 went on record to say “there are certain issues involving technical features, cost and delivery timelines, which are being addressed at the highest level,” concerning the project. 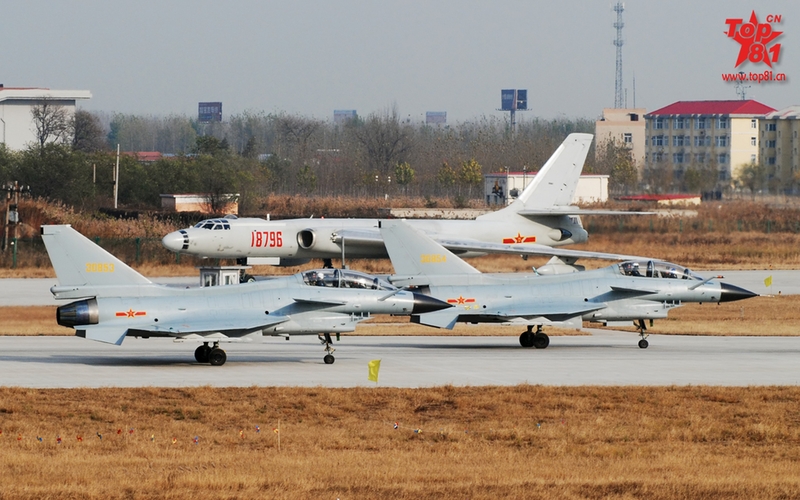 Elsewhere in the PRC, the Chengdu Aerospace Corporation (CAC) J-10 has followed a trajectory of successive improvements and expanded multirole capabilities similar to that of the J-11 family. The first frontline unit was established in June 2004 and the last of the initial J-10A models was completed in early 2014: “At first, the J-10A was fielded with a limited air-to-air-armament,” observed Mr. Rupprecht: “In recent years its weapons options have been steadily expanded. 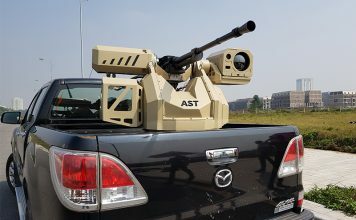 For example, a new twin-rail launcher has been developed to carry four rather than two Leihua Electronic Technology Research Institute PL-12 ARH-guided AAMs. Luoyang Electro-Optics Technology Development Centre LS-500J precision-guided munitions have also been seen more regularly,” he continued. The next series-production model, the J-10B, was revealed in March 2009. This featured a new fixed diverter-less supersonic inlet for the aircraft’s Saturn-Lyuika AL-31FN turbofan, a passive electronically scanned array X-band radar; an infrared search and track and laser rangefinder system and a wide-angle head-up display. The latest J-10C represents a fully multirole fighter with an unknown AESA radar. Although it first appeared in December 2013, it was 22nd September 2015 before a J-10C prototype completed a first flight powered by an indigenous Shenyang WS-10 turbofan. Pakistan has been linked with a possible J-10 purchase, but until now has relied upon the JF-17/B Thunder to meets its multirole fighter needs. A joint programme developed by the Pakistan Aeronautical Complex (PAC) and CAC of China, the JF-17 has introduced incremental improvements in multirole capability via the form of production block upgrades. The initial Block-2 version took to the air from PAC’s Kamra in northern Pakistan on 9th February 2015. It features changes, compared to previous marques, including a refuelling probe, improved oxygen system, and enhanced electronic countermeasures. Pakistan has 50 JF-17 Block-II aircraft under contract, which will join the 50 JF-17 Block-I aircraft previously delivered. 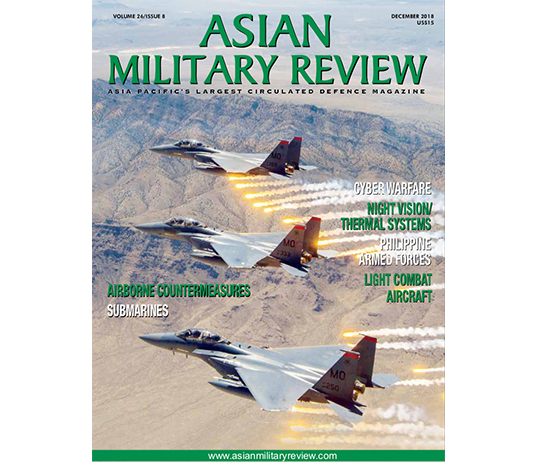 More information and news regarding Pakistan’s JF-17/B aircraft can be found online at asianmilitaryreview.com. Pakistan ultimately plans to acquire 150 JF-17/Bs, which will complement the Pakistan Air Force’s General Dynamics/Lockheed Martin F-16 family fighters deliveries of which have periodically been held up by the US government. In total, Islamabad placed orders for 111 F-16A/B Block-15 fighters, but only received 40 between 1983 and 1987 due to a US embargo imposed as a response to Pakistan’s nuclear weapons programme. These were supplanted from 2010 by 18 new F-16C/D Block-50/52 fighters aircraft, and in late 2013 Pakistan acquire 13 second-hand Royal Jordanian Air Force F-16A/Bs. Outside Pakistan, the F-16 family remains the most numerous US fighter in the Asia-Pacific, with over 400 examples serving with Indonesia, the ROC, the Republic of Korea, Singapore and Thailand. The ROC was the first Asia-Pacific F-16 operator to choose to upgrade its aircraft with an AESA radar. In 2011 the ROC government decided to put 145 surviving F-16A/B Block-20 aircraft through a capabilities upgrade. In October 2012 Lockheed Martin received a $1.8 billion contract for the work and in October 2015, the first upgraded F-16A/B flew in the US equipped with the Northrop Grumman AN/APG-83 Scalable Agile Beam Radar X-band radar installed. In January 2017, upgrade work began at Aerospace Industrial Development Corporation (AIDC) facilities in the ROC. While two aircraft are being upgraded in the US, work on the remaining 142 fighters will be completed in the ROC, where AIDC will complete between 25 and 28 upgrades annually until 2023, according to reports. Singapore, meanwhile, operates a fleet of 60 F-16 Block-52/52+ fighters delivered between 1998 and 2003. They will be upgraded with new data links, AESA radars and satellite-guided weapons. In December 2015 Lockheed Martin received a $914 million contract to perform the Singaporean F-16 upgrade. Work began in 2016 and will last up to six years. 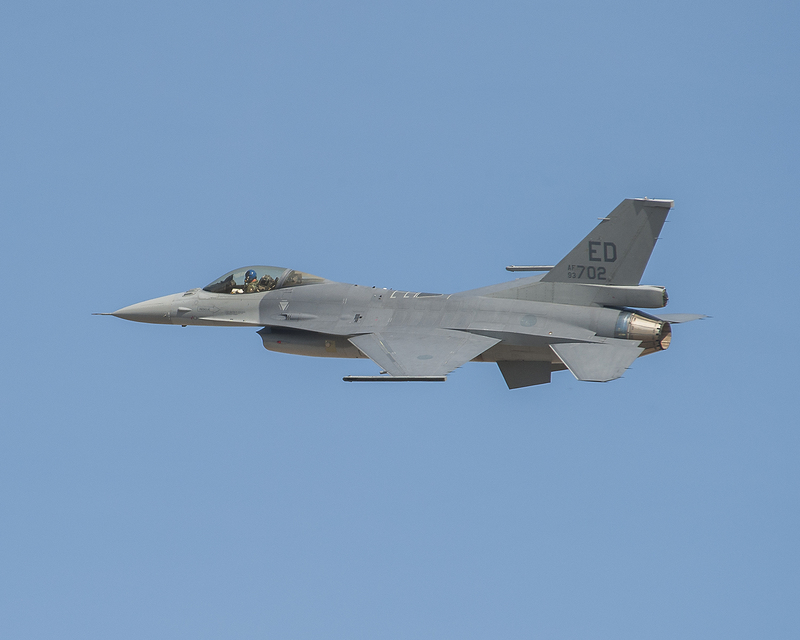 There appears to be no official comment regarding the radar which will equip these upgraded F-16C/D aircraft, although it appears likely that the Republic of Singapore Air Force may opt for the AN/APG-83, given Lockheed Martin’s work upgrading the ROC’s F-16A/B aircraft. Elsewhere in the Asia-Pacific, the ROK originally selected the Raytheon Advanced Combat Radar (RACR) X-band system for its AESA upgrade, which would extend to 134 of its F-16C/D Block-32/52 aircraft. After the collapse of an upgrade deal with BAE Systems, Seoul turned to Lockheed Martin, and outlined a revised $2.5-billion upgrade package. A first upgraded aircraft will be ready in 2018 and the entire upgrade is valued at $1.58 billion, media reports note. Thailand, meanwhile, has launched a modest upgrade programme for its fleet of 61 F-16A/B Block-15 aircraft. Initial upgrade work is valued at $700 million and covers 18 aircraft, which are receiving Northrop Grumman’s AN/APG-68(V)9 X-band radar, together with BAE Systems’ AN/APX-113 combined interrogator and transponder and AN/ALE-47 countermeasures dispenser system. Diehl BGT Defence’s IRIS-T infrared guided AAMs have also been added to the aircraft’s armoury. Joining the F-15 family in the Asia-Pacific is the McDonnell Douglas/Boeing F-15 family which serves with Japan, the ROK and Singapore. Japan has launched upgrade programmes for both its F-15J/DJ fleet and for its indigenous Mitsubishi F-2A/B fighter. In 2014 twelve F-15Js received upgrades at a cost of $12.5 million each. The upgrades addressed the F-15J’s Mitsubishi Integrated Electronic Warfare System, forward looking infrared and infrared search and track capability and added a night vision goggle capability to the cockpit. The F-2A/Bs are receiving the Mitsubishi J/APG-2 AESA X-band radar as well as new Mitsubishi AAM-4B ARH-guided AAMs and Boeing Joint Direct Attack Munition family weapons. Currently, Japan operates 153 F-15J/DJs, and 94 F-2s. Looking to the future, the first two customers for the Lockheed Martin F-35A/B/C Lightning-II in the region are Japan and the ROK. Japan’s first four F-35As are being built in the US, while Mitsubishi Heavy Industries will assemble the remaining 38. The ROK, meanwhile, has selected the F-35A and in September 2014 announced its plan to acquire 40 for delivery between 2018 and 2021. The presence of the F-35A/B/C in the Asia-Pacific allied with the emergence of at least two fifth-generation fighter designs from China (the CAC J-20 and SAC J-31) looks set to fuel continued activity in the multirole fighter market. At the more ambitious end, Japan and the ROK are both pursuing indigenous fighter programmes (the F-3 and KF-X, respectively), while countries including Indonesia and Malaysia are due to embark on long-delayed fighter acquisition programmes which may commence within the next five years. Alongside these efforts, a continued demand for ‘fighter mass’ in the form of robust fighter fleets, will ensure that existing fighter inventories continue to be upgraded to keep pace with technological developments.